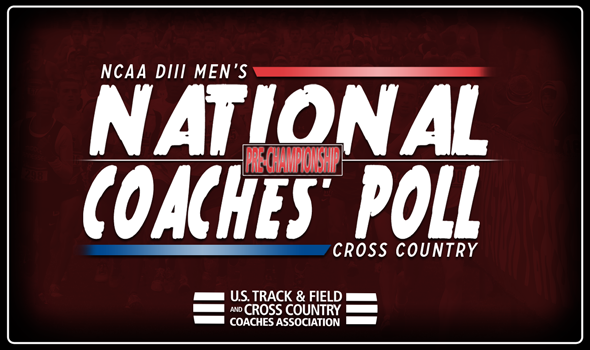 NEW ORLEANS – Regional Championship Weekend left its mark on the final NCAA Division III Men’s Cross Country National Coaches’ Poll that was released Tuesday by the U.S. Track & Field and Cross Country Coaches Association (USTFCCCA). There were only four teams that remained in the same place from the previous index, while 10 jumped multiple spots. North Central (Ill.) captured the Midwest Region title and headlines the poll for the 12th consecutive week, dating back to last year. The Cardinals easily dispatched the competition this past weekend as they scored 34 points and put six runners in the top-15. Dhruvil Patel and Jared Borowsky went 2-3 to lead the charge for North Central (Ill.). Haverford leapfrogged UW-La Crosse for second place and ties its best ranking in the past five years. The Fords scored just 25 points this past weekend to win the team title in the Mideast Region. Graham Peet and Henry Woods went 1-2 within two seconds of each other. Atlantic Region champion SUNY Geneseo and West Region titlist Pomona-Pitzer round out the top-5 this week. MIT, winner of the New England Region, vaulted three spots from No. 10 to No. 7. Dennis Maloney was the top finisher for the Engineers at Southern Maine with a third-place showing, while two of his teammates joined him in the top-20. Carleton made one of the biggest jumps of the week. The Knights soared 14 spots from No. 28 to a tie for 14th following their runner-up finish in the Central Region. Donson Cook-Gallardo was the top finisher for Carleton at the meet, virtually tying Central College’s Mark Fairley for the individual title. UC Santa Cruz went from unranked to No. 20 after a breakthrough performance at the West Region meet. The Slugs entered the meet ranked fifth in the region, but finished runner-up to punch their ticket to NCAAs. RIT is also new to the poll in Week 8. The Tigers took third in the Atlantic Region.